There's a new gluten-free cookbook that has joined the ranks in my kitchen bookshelf and it's a real winner. Nicole Hunn is the newly published author of "Gluten-Free on a Shoestring: 125 Easy Recipes for Eating Well on the Cheap" (NY: Da Capo, 2011) and has been writing at her blog for the last couple of years as well, since finding out that her son had celiac disease. The publishers were kind enough to send me a review copy of Nicole's new book to review and I enjoyed reading through and learning some new methods for shopping and baking. I like her witty prose and her practical, economical cooking style in equal measure and wrote down a ton of notes and menu ideas. She emphasizes once-a-week and once-a-month cooking days to make up vats of broths, sauces, extra portions of casseroles, etc. to tide busy home cooks over on weeknights and her tips about piggy-backing meals and making creative use of leftovers, bulk and seasonal/sale items are full of great advice. Another delightful note at the end of many recipes is a cost comparison of the homemade item versus a store-bought item. I'm always eager to try out other people's recipes for baked goods, so I made two items from the Shoestring Cookbook. Nicole advocates using Better Better Flour mix, but since I didn't have any in the pantry, I used a mixture of white and brown rice flour, buckwheat flour, and potato starch for the all-purpose flour called for in these recipes. The first cookbook test-drive involved a terribly tasty Focaccia (pp. 94-95 of the book or you can find it here at her blog). Mine was was topped with sliced scallions, dried herbs and sea salt for a variation of the basic recipe. We enjoyed it as is the first night and then I cut it up into Focaccia fingers the next day for dipping into marinara sauce. A crowd pleasing recipe at our house, for sure. Husband Dan was most keen to try out her flour tortilla recipe, since we hadn't yet found a great gluten-free version. The Shoestring Tortillas (pp.120-121 of the cookbook, no recipe posted on Nicole's blog) came out wonderfully pliable and moist, I suppose because there is some vegetable oil in the batter. They were easily rolled around various fillings without crumbling like other GF recipes we've tried and Dan was over the moon. He's made them twice since and enjoyed them filled with eggs and cheese for breakfast burritos and filled with beans and fish for heartier main dish burritos. This recipe alone makes the book a real keeper in our estimation. Look at that tortilla curl! Nicole has wonderful posts about money-saving ideas and tons of gluten-free recipes (I counted 94 of them) on her blog, so you can give her recipes a spin in your own kitchen before deciding whether or not to buy her new cookbook. 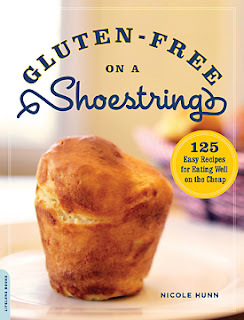 I think it would make a great introductory cookbook for anyone who is newly diagnosed with celiac disease or gluten intolerance, though there are also enough uncommon recipes to keep someone who's been cooking gluten free for awhile interested. I'm tempted by Brioche Bread, Lo Mein, Arepas, and Apple-Cinnamon Toaster Pastries myself. This wonderful cookbook arrived just in time for me to participate in the Book of Yum's Adopt a Gluten Free Blogger event, so of course Nicole is my adoptee this month. Book of Yum will have the roundup posted sometime after the April 5 deadline. Thank you so much for the lovely review. I'm thrilled to think of your husband making such good use of the flour tortilla recipe. I love having that one in my back pocket, since my kids seem to barely notice what's inside, & just concentrate on the "bread" of it. Thank you so much for *adopting* me! I'm blushing like a schoolgirl. :) As my youngest child (she's 5) would say, I have ringfavors for you (that means being grateful, to a 5 year old). I am a fellow gluten-free eater and read your blog (which I love by the way). I live in Toronto and so I assume you have other readers that are from here and I recently opened a gluten-free cafe/food shop in downtown Toronto. I thought that your readers from Toronto might be interested in hearing about us as a place to get 100% gluten-free and processed sugar free treats and grocery items. If that doesn't fit the dialogue you are having with your readers, that's totally fine but I just thought it was worth asking. As a reader of your blog, I would be interested to hear of safe place just for me! These recipes are too good, I made this for my mom.